couldn’t wash, dry and put away dishes? left laundry scattered about the floor? left crumbs all over the table? In today’s busy world, most of us are taxi-ing our kids to and from school and activities. We attempt to feed them something healthy and have them get their school work done. There’s not much time after that for Future Roommate Training. So, if your kids are not yet in school, teach them early! This doesn’t mean it’s too late if your kids are school-aged and already crazy-busy. But it might be harder. Younger kids are primed for this type of learning and overall more receptive to learning these life skills because they want to do “big” things and be like mom and dad. Older kids have been taught to see these tasks as “work” and want to spend time doing other things. Like most of us. Because we are so busy, it can be very hard to s..l..o..w down and teach kids the things that would take us a fraction of the time to complete. And sometimes, of course, we MUST take over a job and do it ourselves. But if we teach our kids to sweep when very young, THEY can be the sweepers. And soon, I am no longer sweeping and that is off my list, freeing me to do other tasks that only I can do in our house. Like nurse a baby, sort photos, or write a blog post. It saves you WAY more time in the future! You WILL NEED to expect a five year old that is sleeping to do five year old work. Not Mom-level work. But, as we all know, a five year old will not stay five and the practice will help him improve his sweeping skills. In addition to freeing up more time for you (which, to me, is the most valuable aspect of this), Future Roommate Training really does go beyond my selfish motives. 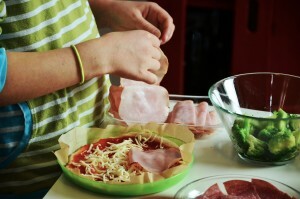 your children feel more invested in the meal they created or the counter they wiped. They might think twice before complaning aobut another meal created by a family member or before they leave toothpaste on the counter. Please note the use of the word might. We’re not talking miracles here, but habits built over time. Your family is on the same team. We’re all working together. It’s not Mom The Chore Nagger vs. Escape Artist Kids. Which leads to…. You do not become the household martyr. Too many moms quietly (or rather, passive-aggressively) do allllll the jobs in the house, becoming Mom as Maid. Until one day she explodes, yelling that no one appreciates her, storms out of the house and takes off for Hawaii. Or so I’ve fantasized heard. Let me just add here that creating a culture of pitching in with kids is much easier if both parents help with chores. I know that’s not realistic for all families. And I also know that roles are naturally and necessarily divvied up. This often happens along gender lines and that’s OK. There’s also usually cross-over. If The Captain never showed his skill with needle and thread, our floor would be riddled with loose buttons. And I never did the girls’ hair. He was way better. And he takes care of all car-related jobs. OK, maybe the cross-over in our house is unbalanced. I digress – it’s good to have conversations about how we each pitch in and contribute to the family, especially the ways the kids can’t see day-to-day. And it DOES make it easier if all the adults in the house pitch in on those unavoidable, day-to-day jobs like meal prep and clean up, laundry and household tidying up. OK, so which job takes the most of your time AND can easily be delegated to kids? If you actually eat real food and don’t have a sizeable take out budget, it’s meal prep and clean up. So let your kids help! Let them chop, let them peel, let them blend, let them sauté, let them set, let them clear and let them wash. If the thought of this just made you grimace, I encourage you to check out Kids Cook Real Food, which is an awesome program that helps you teach your kids skills they can use right away in the kitchen. You can start with the (sorry, no longer) free Knife Skills Program. Whaaa? Let my kids wield knives? Yup. Just go check it out. use right-sized knives to cut veggies that can be “ugly” for crock pot stews, casseroles, etc. more that I just can’t remember because I wasn’t making a list when they were little. Mostly, they hung out with me in the kitchen and I tried to let them help when they asked. So you can do all that. But some of us didn’t get a lot of our own kitchen/cooking training as we grew up. 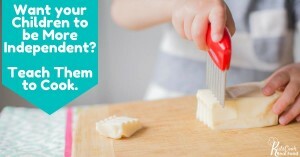 Kids Cook Real Food might fill in some of YOUR gaps and help you fill in any your kids have. I can honestly say that the Knife Skills lessons (FREE right now) taught me a few great tips and my nine year old enjoyed watching it and learning. The great thing is, after watching, she wanted to practice those skills. Future Roommate Training is not limited to the kitchen. But the kitchen IS a big part of where you spend your time and energy when you have kids. If they have kitchen skills, they will be able to feed themselves as young adults, saving health and food costs during those years. But do invest in all areas of your kids’ life skills knowledge. You’ll see results in the near future and in the adults you are raising! Thanks, KP! Feel free to share with others.